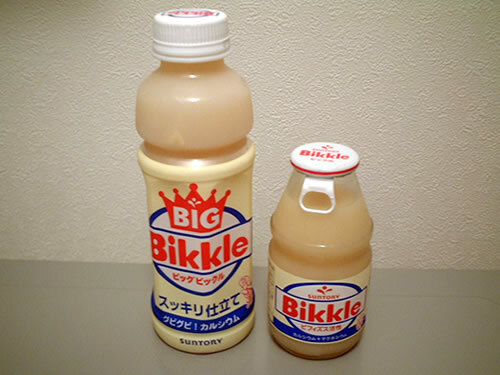 When you're in a convenience store full of the usual soft drinks and teas, it's hard to ignore a drink with the name of 'Bikkle'. Looks and taste aside, you can't help but smile when you read it, or feel like you want to pat it on the head. Say it with me a few times! Bikkle, Bikkle, Bikkle! See? Bikkle. Ok that's enough of that. Bikkle--gotcha! Bikkle. So why would anybody name their drink Bikkle? Well that's a tough one and Suntory's website didn't provide any deep answers. If you ask me it's kind of like a cry for help. It's like a 'someone please buy me cuz my name is Bikkle, and that's a cute name!' kind of deal. If my name was Bikkle I'm sure I'd have confidence issues too. As if one Bikkle wasn't enough, they even have a Big Bikkle. They probably did it so that the regular Bikkle doesn't feel ostracized when surrounded by Coke and Pepsi products. Ok so what the hell is Bikkle anyway? It's watery, milky-yellowish colour is reminiscent of that chalky stuff they make you drink in the hospital before they do a major stomach x-ray. Hmmm... Besides it's name, it doesn't seem to have much going for it so far. Looking closer at the label, I find that Bikkle has stuff like calcium and magnesium in it. Calcium, ok fine, but not sure what I need magesium for, an underwater flare maybe? Streching my Japanese abilities to their utmost, I find that it also has a type of bacteria called 'bifidus' (also pretty fun to say), which is supposedly a 'good' bacteria found in the intestines. Hmm, seems that ol' Bikkle is kind of like a yogurt drink. And after tasting it, it definitely has a yogurt like flavour. Not bad actually, but a bit on the sweet side. Anyway I finished my regular sized Bikkle but I'm not filled with excitement about opening my Big Bikkle. I guess I'm not a true Bikkle convert. Anybody want it?